But a bailout by itself is not enough. If the country does not radically cut spending and streamline its services, it will go bankrupt. On 19 December, Standard & Poors downgraded Ukrainian foreign debt to CCC with a negative outlook. Ukraine is at risk of a sovereign default in the next six months. All this, together with the mismanagement of previous years, has dealt Ukraine a mortal economic blow. Without foreign assistance, there is only one way out of the crisis – default. But Western creditors have not allowed Ukraine to go bankrupt. On 30 April, the IMF approved a two-year Stand-By Arrangement (SBA) for Ukraine of $17.1 billion, of which some $4.6 billion has already been transferred. Apart from this, the EU, World Bank, USA, Canada, and Japan have all promised large sums. Before November, Ukraine had received at least $4.8 billion from these sources, according to economic analyst Yulia Shibalkina, from CASE Ukraine. This means Ukraine has already received some $9.4 billion from various sources and will receive the remaining part of the IMF loan (at least $12.5 billion) in 2015. Now, however, the IMF calculates that another $15 billion will be needed. Foreign aid has, for the time being, allowed Ukraine to pay its existing foreign currency debts and buy Russian gas, but it does not allow it to support previous levels of domestic spending. Nor will root and branch reform be possible without a serious reduction in Ukrainian standards of living. The deficit for the whole government finance sector (not just the budget) reached 10% of GDP ($12.7 billion) in 2014, says the director of the Bleyzer Foundation, Oleg Ustenko. Foreign aid cannot completely plug this gap. Ukraine is thus having to put in place its own ‘quantitative easing’ by issuing government-backed securities to support its banking sector as well as subsidising cheap gas tariffs and other utilities, for the general population. This monetary easing is one of the main reasons why the hryvnia has slipped from 8 to 16 to the dollar since the start of the year. And that is just the official exchange rate – on the black market, dollars sell for up to 20 hryvnias. Imported goods, including medicine, petrol, white goods, and automobiles, have become more expensive in Ukraine. Foreign trips and purchases have become a luxury. At the start of the year about 22.1% of Ukrainians lived below the absolute poverty line, which is to say they spent less than 1,218 hryvnias a month ($80 at the official conversion rate). That 'breadline’ statistic is an artificial one – the government has not re-calculated this amount in 2 years; it has not updated the 'bare minimum' shopping basket for 14 years. With the economy contracting and unemployment rising, at the beginning of 2015 there may be a great many more families facing poverty, says Ella Libanova, director of the Institute of Demographic and Social Research at Ukraine’s National Academy of Sciences. Apart from the country’s traditional poverty, there is also the so-called ‘new poverty’ of the country’s internally displaced persons (IDPs). The UN reports that on 12 December there were at least 542,000 IDPs coming from Russian-occupied Crimea as well as the Donetsk and Luhansk Regions, where the military conflict continues. Many IDPs have lost their livelihoods and incomes. Often they are unable to find work in their new locations, rent or buy accommodation, and are discriminated against by both ordinary people and government officials. “Verkhovna Rada of Ukraine” [Parliament of Ukraine]. The Supreme Council of Ukraine, otherwise known simply as Rada. It is worth remembering what Ukraine has been through. When Yanukovych fled to Russia in 2014, he took with him a good part of the government – the prime minister, general prosecutor, head of the Ukrainan security services (the SBU), army and police chiefs. Many other military and police officers, especially the highly placed, defected to Russia or simply fled. The remainder were left demoralised. In February 2014, the first aim of the new Ukrainian leadership was political stabilisation. The only legitimate body still functioning was the parliament, the Verkhovna Rada. Deputies selected Oleksandr Turchynov as speaker of the parliament and acting president until new elections could be held. They also set up a provisional government under Prime Minister Arseniy Yatsenyuk. In March, Turchynov changed the leadership at the regional level, to prevent the separatists in eastern Ukraine having a voice. He also started reforming the army and police and oversaw the creation of vigilante defence detachments. On 25 May, the businessman Petro Poroshenko won the snap presidential election. At the same time there were elections for the mayor of Kiev and the national legislative assembly. But the parliament, which had been formed under the previous government, blocked many laws aimed at reforming the country. The anti-corruption bill was passed with considerable amendments, and will only take effect in 2015. Laws on public television broadcasting, higher education reform, the prosecutor’s office, access to public information, and state procurement were also passed. But the package of tax reforms failed for lack of support. In September, the Ukrainian army suffered huge losses in the eastern city of Ilovaisk. On 5 September in Minsk (Belarus), representatives of Ukraine, Russia, the OSCE, and the rebel separatists signed an agreement, which fixed a demarcation line between the two opposing sides. On 26 October, a snap parliamentary election was held. A majority of seats were won by the parties of Arseniy Yatsenyuk (People's Front) and Petro Poroshenko (Petro Poroshenko Bloc). After the election the deputies had trouble in agreeing the formation of a coalition – a split had formed between the office of president and the office of prime minister, with both sides wanting more say in the government. A coalition agreement was only signed on 21 November after US vice president Joe Biden had visited Kiev. Three other parties were signatories, together with Yatsenyuk and Poroshenko. A coalition agreement was only signed on 21 November after US vice president Joe Biden had visited Kiev. Horse-trading for posts in the government went on until 2 December. Yatsenyuk remained as prime minister but new ministers were brought in. On 11 December, deputies voted in support of the government programme of work – an empty formality – and according to the constitution, the cabinet may now not be dismissed for a year. There are now foreigners working in the Ukrainian government and bureaucracy. In fact, there have been foreigners in the Ukrainian government before. Under Viktor Yanukovych, the defence minister was Dmitry Salamatin, a Russian citizen until 2004. In 2006 he became a member of the Ukrainian parliament, and in 2012 was defence minister for a few months. 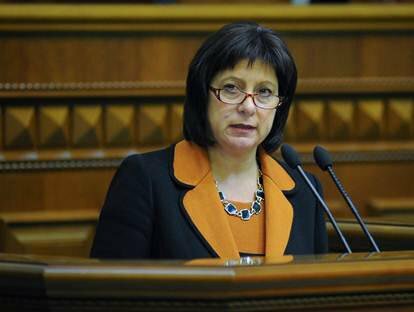 In December 2014, an American of Ukrainian extraction, Natalia Yaresko, was appointed finance minister. The Lithuanian Aivaras Abromavičius was made minister of the economy. The health minister is the Georgian Aleksandr Kvitashvili. The deputy interior minister is also a Georgian, Eka Zguladze. They all received Ukrainian passports, but it is not yet known if they have given up their previous ones. Interestingly, Natalia Yaresko had worked in the US embassy in Ukraine in the 1990s. Until recently she was running the holding company Horizon Capital, which had an office in Kyiv. Both private individuals and the US government had entrusted their money to this company. Officially, the selection of foreign candidates was run by a recruitment agency. The Presidential Administration said that International Renaissance Foundation (part of George Soros’ Open Society Foundation) had been responsible for selecting the agency. However, the head of the International Renaissance Foundation, Yevhen Bystrytsky, claimed that this was not true. According to him, the foundation had merely been asked to contribute towards the work of the agencies. The Soros Foundation is playing a large role in changes in Ukraine. But the Soros Foundation is playing a large role in changes in Ukraine. For example, it supports the initiative for the creation and advancement of a ‘reanimation package of reforms’ (together with the UNDP, Swedish International Development Cooperation Agency, The European Endowment for Democracy, and Pact). Activists of this initiative have so far managed to have 17 reform bills introduced. Several of the activists, such as Anna Gopko, have even become parliamentary deputies. Ukrainians react in various ways to the presence of foreigners in the parliament. Critics say that the country has lost its independence. Optimists reckon that the foreigners will find it easier to reform the country’s economy and lead it out of the crisis. During the night of 28/29 December, the Ukrainian parliament passed the budget for 2015, which is completely unrealistic and will never be implemented. Government revenue is set at 475,200 billion hryvnia (approximately $27.960 billion at the current exchange rate) and expenditure at 527,200 billion hryvnia (approximately $31 billion), but the actual shortfall at the end of the year could well exceed all expectations. For example, Kyiv is calculating on receiving 17 billion hryvnia from privatisations in 2015, but this is simply a fantasy. The same can be said of the planned increase in taxation revenue. Kyiv is calculating on receiving 17 billion hryvnia from privatisations in 2015, but this is simply a fantasy. The 2015 budget allows for GDP to fall to the level of minus 4.5% (in 2014 it was minus 6.5%), inflation to increase to 13.4% (2014 figure was 19%), and the government budget shortfall to minus 3.6% of GDP (currently 4.6%). With this in mind, Prime Minister Arseniy Yatsenyuk has promised that the budget will be reconsidered before 15 February 2015. 'We will make adjustments, depending on the results of our negotiations with the international financial organisations,' he said. On 8 January 2015, IMF specialists will return to Ukraine to decide on the next credit tranches before the IMF Board of Directors meets. It seems likely that the final amendments to the 2015 Ukrainian budget will be dictated by the IMF. The budget currently contains no radical expenditure cuts. At present, about half of Ukraine’s GDP is redistributed via the state budget. This situation is unlikely to change in the New Year. It seems likely that the final amendments to the 2015 Ukrainian budget will be dictated by the IMF. • A 10% tax on lotteries, to be calculated on turnover rather than the prize fund as previously. d) Average salaries across the company are no less than three times the minimum wage i.e. currently no less than 3,654 hryvnia. The government programme of work talks of shrinking the civil service by 10%. At the start of 2015 there were 335,000 civil servants. In 2012 the figure was 275,000, and in 2011 it was 268,000, according to Ilona Sologub, a researcher at the Kiev School of Economics. A 10% cut would still mean there are more civil servants in the country than there were in 2012 or 2011. Sologub proposes more radical cuts, completely closing down 21 departments and ministries in 2014/15. Yet the government continues to increase the number of new ministries and departments instead of cutting them. For example, the government is setting up a new Ministry of Information Politics. Deputies have already chosen the information minister: Yury Stets, a friend of Poroshenko and a former manager at Channel 5 TV, which (still) belongs to the president. Reporters without Borders and the OSCE have already come out against this idea. The online journal Mashable described this structure as ‘the Orwellian Ministry of Truth’. Radical changes in the social sphere are also not to be expected. Minister Pavlo Rozenko expects an increase in the budget of the social affairs ministry, which is overburdened working with IDPs. There are likely to be several waves of tariff increases for utilities, so much longer queues for subsidies can also be expected. The social affairs ministry, like several other Ukrainian ministries still works without a unified register of benefits claimants. In many cases, the ministries have only paper records, without electronic databases. Computerisation could dramatically increase government efficiency, but even filling in the databases (the software already exists) and teaching the personnel to use them will take time. Without these changes it will be impossible to create a modern social welfare system. And without reform of social welfare, there will be little chance of effecting other changes, such as increasing tariffs, monetising benefits and reforming the pension system. For the time being, then, it seems clear that the Ukrainian government is not prepared to make radical decisions, primarily on reducing expenditure on the civil service, or simplifying business red tape. Increased poverty is a risk if the social welfare system is not reformed, and could lead to mass protests. The moment of truth for Ukraine might arrive before the Ministry of Truth has even begun. Standfirst image Verkhovna Rada of Ukraine, uploaded by Fry1989 via Wikipedia. Some rights reserved.